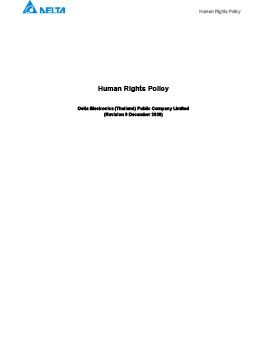 Human Rights Policy | Delta Electronics (Thailand) PCL. Delta Electronics (Thailand) Public Company Limited truly recognizes the importance of and upholds human rights principles. Delta has incorporated human rights principles, namely EICC’s Code of Ethics and ILO’s labor standards into the company’s operations and developed our human rights policy based on the UN’s Guiding Principles on Business and Human Rights – UNGP. We are committed to protecting, respecting and supporting our staff, business partners and vulnerable individuals or groups as outlined in the Delta’s Human Rights Policy in all our business processes. We will ensure that human rights are respected and violations of human rights in all form are prevented throughout the company and our value chain.